As I am not an expert C++ developer, the code is far from perfect and we are not going to discuss it in more detail. The code can be found on github. Building and running the project will print the hash table’s contents to the console. Despite the fact that everything is working at the moment, we are not satisfied with the current solution. Our library files are mixed with the rest of the project and built as part of the same target, which is not ideal. A better way to approach this would be to create a separate target which would include all of our library files and make the main target depend on it. Let’s give it a try. First, we have to select the project in the Navigator pane, and then click on the plus icon below the list of targets. The template we want to select is C/C++ Library. In the next step we’re asked to give it a name and select the library’s type. In our case it should be static. We are going to use the new target to build our C++ code as a static library which will be linked with the binary produced by the main application target. Make sure that the Supported platforms value in the target’s build settings is set to iOS. Otherwise you are gonna get a linker error. Now it’s time to add some files to the newly created target. 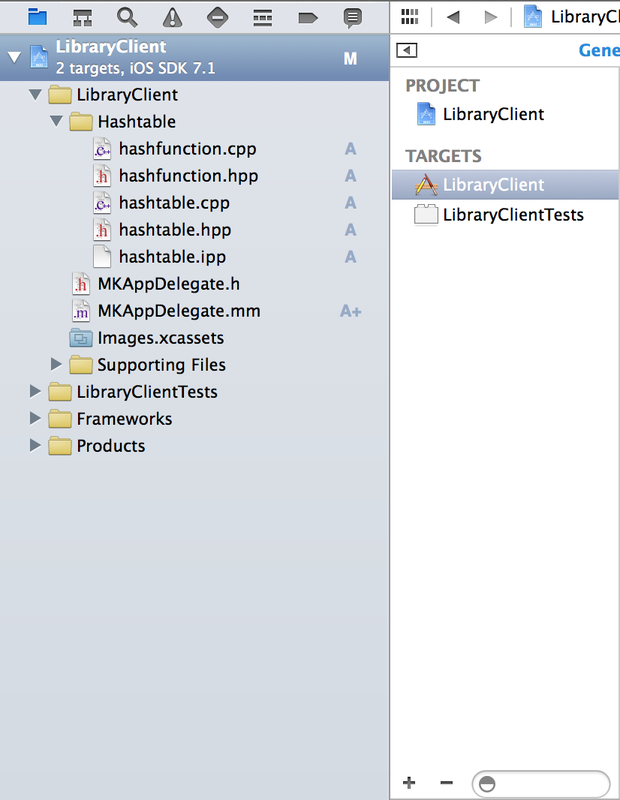 To do this, open the Utilities pane and make sure that target membership for the files hashtable.cpp and hashfunction.cpp is set to the static library target created in the previous step. Since we are going to use the library in the code belonging to the main target, we have to make sure that the library’s target is built before building the iOS application itself. To do this we have to open the Build Phases menu for the main target and add our library as a dependency. 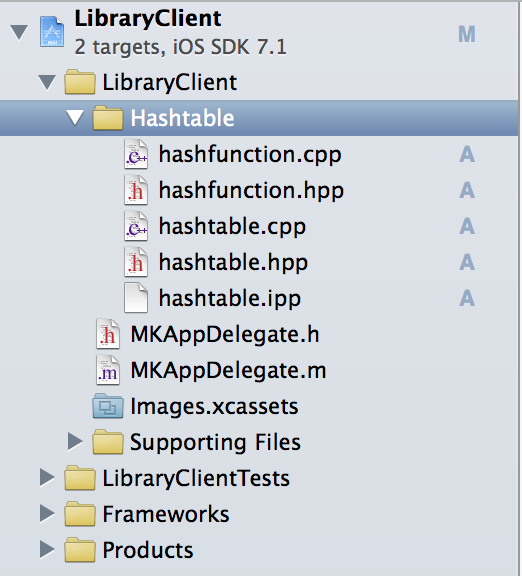 The final step is to tell Xcode to link our main application with the C++ library we created. This can also be done from the Build Phases pane of the main target. Just click on the plus under Link Binary With Libraries and select the appropriate item. And voila, our application should be building and linking correctly. But wait a second, our library files are still mixed with the rest of the application, aren’t they? This is what we are going to fix now. Probably the best approach to solving the problem we are dealing with is creating a separate project for the C++ library which is going to create a static library, and then nesting that project within other projects that will make use of the library. This way we can have a clean separation between projects and we don’t have to worry about making sure that our client code is using the latest version of the library. A fresh version is built every time we build our main target. Creating nested projects is very simple. First, we need to create a separate project for our C++ library and use the C/C++ Library template. After all the implementation files have been added, we need to find the project file and drag it into the tree structure of the client project. Next, we have to copy the steps from the previous section for making the main target dependent on the library’s target and linking with the library’s binary. To avoid linking errors, we need to add a new path to the main target’s Header Search Paths build setting. 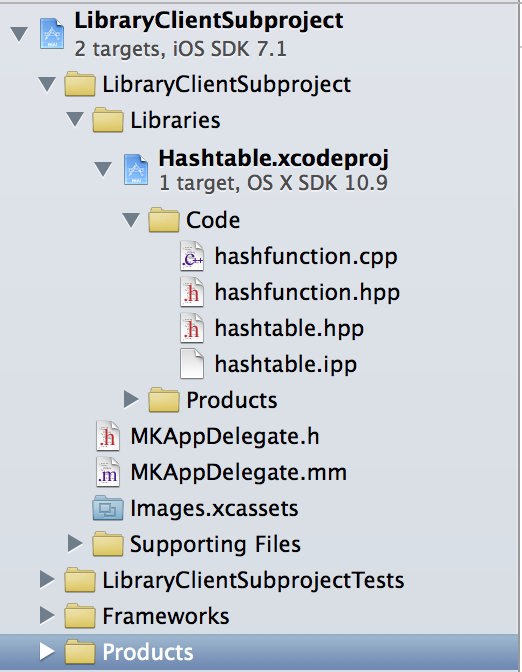 The path should point to the location where header files like hashtable.hpp are located. Even though developing applications in both objective C and C++ may seem like a challenging task, it is definitely worth it. It can shorten your time to market and make maintaining your applications much easier, as you only have one codebase to take care of. With so many great resources on C++ available on-line, there is no excuse not to try! As this is my first post on this blog, I would welcome any comments on what you like and what you dislike about the structure/style of my writing or the subjects being discussed. Thanks!